So I thought about doing a haul post but I think those are more effective on YouTube. 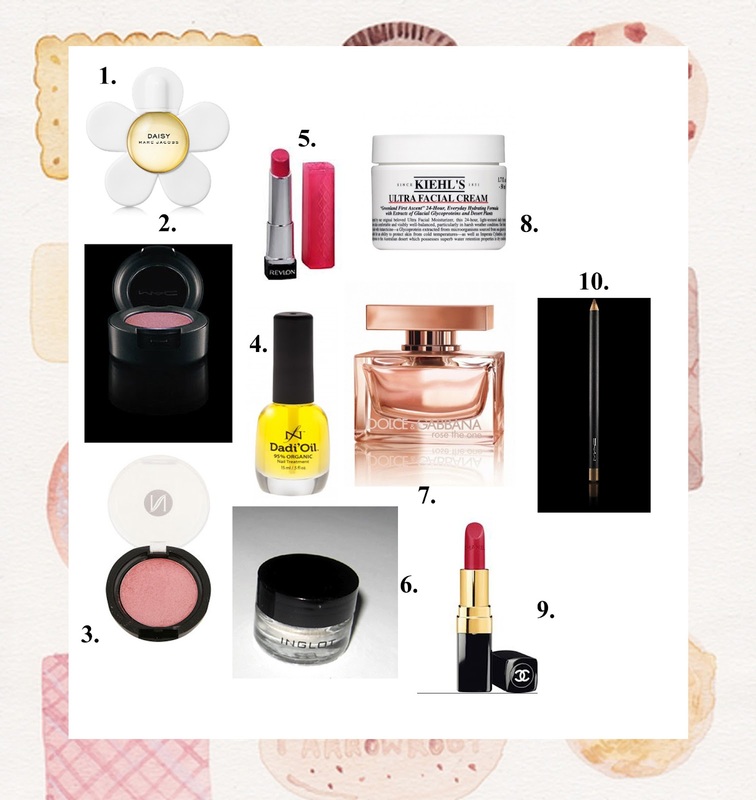 Instead I've decided to collate a list of the products I've been loving each month. Some may be completely new, some are ones I've rediscovered. Either way, I hope you like my August picks! Let me know in the comments section if you use any of these products as I would love to hear your thoughts about them. 1. Daisy Marc Jacobs 20mL, (LE) approximately $35. This is my favourite fragrance & I'd recently used my bottle up. Rather than buying another full sized bottle straight away I thought this miniature would be cute. I bought it on my travels & it fits easily into my bags without being too bulky. It contains top notes of Wild Strawberry, Violet Leaves & Red Grapefruit, heart notes of Violet, Jasmine & Gardenia & base notes of Vanilla & Musks. It smells divine! 2. Trax Eyeshadow by MAC Cosmetics, price unknown. I'm not sure when I got this shadow but I recently found it in my (rather untidy) makeup drawer & I love it! It's the perfect plum colour with a slight shimmer. It looks best paired with lots of eyeliner, mascara & Pearl Reflects Glitter if you like a bit of shimmer. 3. Natio Blush in Rouge Glow, $13.95. I swatched this so many times on holiday & I am so pleased I ended up purchasing this. This blush is the perfect rosy pink & it looks super natural & not too overpowering on the cheeks. It is perfect for everyday wear. 4. Dadi Oil by Famous Names Products, gifted to me by Leah. This is literally liquid gold. Dadi Oil contains a blend of 21 essential oils which are designed to strengthen the nail & prevent brittleness. I've used one other nail oil before & I found it was too greasy & didn't work nicely with my hand cream. This one is not greasy at all & I love the applicator brush it comes with. 5. Revlon Lip Butter in Raspberry Pie, purchased in a sale. The lip butter contains mango, shea & cocoa butters. The colour is gorgeous & it feels hydrating on the lips. 6. Inglot Body Sparkles, price unknown. I picked this up when I was in Melbourne last year. It is very similar to MAC's Reflects Glitter but it isn't as chunky & it has less fallout. I love applying this over my eyeshadows if I want to add a bit more sparkle to my eyes. 7. Rose The One by Dolce & Gabbana, 50mL, $81 on sale. This was a total impulse buy, but since I bought it I've been wearing it most days. This is a softer version of the original & it contains notes of grapefruit, mandarin, vanilla, amber, peony & more. 8. Kiehl's Ultra Facial Cream, 50mL, $54. Throughout Winter my skin has been getting really dry so I bought this. Since I began using it my skin has improved & it feels a lot less dry. It isn't too thick either so you can get away with applying it twice daily if you have combination/dry skin like me. 9. Chanel Rouge Coco Lipstick in #31 Cambon, received as a gift. I have a lot of matte lipsticks which can be quite drying. Thankfully this lipstick is designed to soften, soothe & condition lips. The colour is perfect for fair skinned people (like me) & it is one of those classic shades I can see myself buying again. 10. MAC Eye Kohl Pencil in Powersurge, $29 Duty Free. This eye pencil has a matte/pearl finish & I use it on my waterline to act as a bit of a highlight along the lower lash line. -Products 1 & 3 priced in Australian Dollars. -All other items are priced in New Zealand Dollars. -All images are sourced directly from the product sites.